The Seamaster 2019 ITTF World Tour Hungarian Open, scheduled to start on Thursday 17th January, qualification commenced on Tuesday 15th January. Follow the thrills and spills live from Budapest! Win the crucial points, for Lin Guoyuan, the no.3 seed; that proved the major factor in the men’s singles final against colleague Wang Chuqin, a players whose journey had started five days earlier in the qualification tournament. Lin Gaoyuan won the opening two games by the minimal two point margin, before in the third establishing a 9-8 lead; it was the stage at which Wang Chuqin called “Time Out”, Lin Gaoyuan secured the next two points. In the fourth game Wang Chuqin threatened a recovery, he won the first four points but at 10-9 it was match point to Lin Gaoyuan; once again Lin Gaoyuan seized the opportunity to record a hard fought straight games win (12-10, 12-10, 11-8, 11-9). Notably for Wang Chuqin it was again runners up spot; one year ago he had been beaten in the final by Fan Zhendong. The forehand lethal, always prepared to step around the backhand, Chen Meng, the no.2 seed, won the women’s singles title; at the final hurdle she beat Zhu Yuling in six games (9-11, 11-7, 11-13, 13-11, 11-4, 11-5). Turning point in the match undoubtedly came in the fourth game; Zhu Yuling leading 10-9 and ahead two games to one, elected for “Time Out”, Chen Meng saved the game point and then on her second game point succeeded. In the both the fifth and sixth games Chen Meng established a 5-1 lead, the grip was never relaxed. At 10-4 in the sixth game, Chen Meng held six match points, she succeeded at the second attempt winning a long top spin high quality rally in what was by some distance the best point of the match, serve and receive had dominated. One month after their head-to-head encounter at the Seamaster 2018 ITTF World Tour Grand Finals, Lin Gaoyuan and Xu Xin met once again on the world stage, this time for a spot in the gold medal match at the opening ITTF World Tour event of the year. A closely contested affair which saw three games decided by no more than a two point difference between the two players, but in the end there was a clear victor with Lin Gaoyuan coming away with a 4-0 win over the pen-hold grip specialist (14-12, 11-9, 11-6, 11-9). Defending champion and seeded first for the Men’s Singles draw in Budapest but Fan Zhendong has missed out on a place in the final. In the last four the hot favourite for the title fought back from a 8-4 points deficit in the deciding game to draw level at 9-9 only for his unseeded opponent Wang Chuqin to win the following two points to complete the upset (7-11, 11-7, 13-11, 5-11, 12-10, 3-11, 11-9). The concluding day of the Seamaster 2019 ITTF World Tour Hungarian Open is here, a day which sees both the Men’s and Women’s Singles champions crowned in Budapest. Grab a look at the schedule for Sunday 20th January here. Opponents one day earlier in the second round of the men’s singles event when Xu Xin had beaten Liang Jingkun by the very narrowest of margins, the duo combined to win the men’s doubles title on the first international appearance as a partnership. The no.5 seeds, at the final hurdle they beat Chinese national team colleagues, Fan Zhendong and Lin Gaoyuan, the no.2 seeds, in five games (11-5, 9-11, 11-7, 5-11, 11-8). Beaten by Chinese national team colleagues, Ding Ning and Chen Meng, in the title deciding contest at the Seamaster 2018 ITTF World Tour Shinan Korea Open, their only previous appearance as a partnership on the international scene, Wang Manyu and Zhu Yuling, the top seeds, gained an air of revenge in Budapest. They beat Chen Meng and Sun Yingsha, the no.3 seeds (8-11, 11-7, 15-13, 11-2) to secure the women’s doubles title. Gold medallist at the Buenos Aires 2018 Youth Olympic Games versus the bronze medal winner at the Nanjing 2014 Youth Olympic Games; the verdict went in favour of the former, China’s Wang Chuqin beat Brazil’s Hugo Calderano in six games (5-11, 11-6, 11-8, 11-4, 12-14, 11-5). Winners of the Mixed Doubles title at the Seamaster 2018 Austrian Open, now Xu Xin and Liu Shiwen have become the first partnership to collect an ITTF World Tour Mixed Doubles trophy for a second time. At the final hurdle in Budapest the Chinese pair accounted for the host nation’s Adam Szudi and Szandra Pergel in straight games (11-3, 11-6, 11-5) to bring the Hungarian duo’s fantastic campaign to a halt. Competing in his first match of the event following two walkover wins but that didn’t stop Vladimir Samsonov from getting up to speed in quick fashion, establishing a two games to one lead in his quarter-finals match with China’s Lin Gaoyuan. However, the following three games were decided by no more than a two point margin in Lin Gaoyuan’s favour – in game six Vladi fought back from 10-4 down to pull it back to 10-9 but in the end the win went to his Chinese counterpart (10-12, 11-7, 7-11, 11-9, 12-10, 11-9). The master of pen-hold China’s Xu Xin, seeded second, has booked his place in the last four of the Men’s Singles event, securing a convincing 4-0 win against Korea Republic’s Lim Jonghoon (13-11, 11-9, 11-7, 11-8). Champion in the Hungarian capital last year but that feat won’t be repeated in 2019 with Wang Manyu falling at the penultimate round of the Women’s Singles draw. Struggling to get a foothold in the match the no.3 seed was shown the door by the player seeded directly above her in Chen Meng, who needed just five games to seal her spot in the final (11-9, 11-9, 11-7, 7-11, 11-5). Zhu Yuling is the first player to confirm her place in the Women’s Singles final following a dramatic semi-finals encounter with fellow Chinese colleague Liu Shiwen. Trailing by a 1-3 deficit top seed Zhu Yuling responded with back-to-back game wins to take the match right down to the wire – in the decider Liu Shiwen held a match point opportunity but failed to capitalise on it as Zhu Yuling won three points in a row to claim a 4-3 victory by the narrowest of margins (5-11, 11-9, 8-11, 8-11, 11-6, 11-9, 12-10). And we’re back underway in Budapest. Take a look at the schedule for Saturday 19th January here. The leading names in the women’s singles event all booked penultimate round places; China secured every step of the podium. At the quarter-final stage, all Chinese clashes witnessed success for Zhu Yuling, the top seed, against Chen Xingtong, the no.6 seed (11-4, 11-4, 11-8, 11-8) and for Liu Shiwen, the no.4 seed, when facing qualifier Sun Yingsha (11-6, 11-8, 11-9, 13-11). In the opposite half of the draw, Wang Manyu, the no.3 seed, overcame Portugal’s Fu Yu (11-9, 11-3, 8-11, 11-5, 11-4); Chen Meng, the no.2 seed, ended the hopes of Romania’s Bernadette Szocs, the no.10 seed (8-11, 7-11, 11-6, 11-7, 11-5, 11-4). Beaten by Chinese compatriot Liang Jingkun in the final just over two months ago in Austria, Xu Xin, the no.2 seed, extracted revenge but only just; he in the second round of the men’s singles event he emerged successful by the very narrowest of margins (11-6, 11-8, 7-11, 10-12, 9-11, 11-6, 13-11). Success in a thrilling contest, it was the same for Korea Republic’s Lim Jonghoon who upset the order of merit; the no.12 seed, he beat England’s Liam Pitchford, the no.8 seed, by the minimal two point margin in the decider (11-7, 9-11, 11-6, 11-13, 8-11, 11-9, 14-12). Runner up one year ago when likewise required to compete in the qualification tournament, China’s 18 year old Wang Chuqin caused a second round men’s singles surprise to keep hopes of a repeat finish very much alive. He recovered from a two games to nil deficit to beat Frenchman Simon Gauzy, the no.13 seed, in six games (8-11, 3-11, 11-5, 11-5, 11-3, 11-9). Required to compete in the two day qualification tournament Russia’s Alexander Shibaev and China’s Wang Chuqin both booked quarter-final men’s singles places. Alexander Shibaev progressed courtesy of success against Hong Kong’s Wong Chun Ting, the no.5 seed (11-8, 8-11, 8-11, 11-6, 11-7, 11-5); Wang Chuqin overcame Frenchman, Simon Gauzy, the no.13 seed (8-11, 3-11, 11-5, 11-5, 11-3, 11-9). Quickly into his stride, well aware that in the guise of Sweden’s Kristian Karlsson, the no.14 seed, Brazil’s Hugo Calderano, the no.4 seed reserved his place in the quarter-finals of the men’s singles event; he emerged successful in five games (11-4, 11-8, 8-11, 11-3, 12-10). Focused on retaining the title secured one year ago, China’s Fan Zhendong made a further stride in a bid to achieve his avowed goal. The top seed, he accounted for Chinese Taipei’s Chuang Chih-Yuan, the no.9 seed in six games (11-9, 15-17, 11-7, 11-9, 7-11, 14-12). Thoroughly prepared for the task in hand, the host nation’s Adam Szudi and Szandra Pergel hit top form at the semi-final stage of the mixed doubles event; the no.8 seeds, they beat Russian qualifiers Alexander Shibaev and Polina Mikhailova in three straight games (12-10, 11-7, 11-4). In the final they meet China’s Xu Xin and Liu Shiwen, the no.5 seeds; in the corresponding penultimate round encounter they ended the hopes of Slovakia’s Lubomir Pistej and Barbora Balazova, the no.2 seeds (11-8, 11-4, 11-7). The title decider is scheduled for 12.20 pm (local time) on Saturday 19th January. Liang Jingkun and Xu Xin alongside Chinese national team colleagues, Fan Zhendong and Lin Gaoyuan reserved their places in the title deciding contest following penultimate round wins of a somewhat different nature. Impressively, Liang Jingkun and Xu Xin, the no.5 seeds, beat French qualifiers, Tristan Flore and Emmanuel Lebesson in three straight games (11-6, 11-7, 13-11); in rather closer contest, Fan Zhendong and Lin Gaoyuan, the no.2 seeds, overcame Hong Kong’s Lam Siu Hang and Wong Chun Ting, the no.3 seeds, in five games (7-11, 11-7, 12-14, 11-7, 11-3). The final is scheduled for 7.20 pm (local time) on Saturday 19th January. Illness has forced Romania’s Elizabeta Samara, Germany’s Patrick Franziska and Hong Kong’s Lee Ho Ching to withdraw from play in Budapest. The outcome is that at there will be no women’s doubles semi-final; the final on Saturday 19th January will be an all Chinese affair between Wang Manyu and Zhu Yuling, the top seeds, in opposition to Chen Meng and Sun Yingsha, the no.3 seeds. In the penultimate round Wang Manyu and Zhu Yuling were scheduled to face Elizabeta Samara and Bernadette Szocs, the no.7 seeds; Chen Meng and Sun Yingsha, Doo Hoi Kem and Lee Ho Ching, the no.2 seeds. Also Vladimir Samsonov of Belarus books a quarter-final men’s singles place without playing a match. In the opening round he received a walk-over against Germany’s Qiu Dang, in the second round he was due to face Patrick Franziska, the no.7 seed. Both unseeded for the Women’s Singles competition and therefore required to start right at the very beginning in the two-day qualification tournament, Portugal’s Fu Yu and Germany’s Petrissa Solja had both performed well to reach the last 16 of the main event. However, only one could progress and after an intense duel it was Fu Yu who took the plaudits, recovering from three games down to draw level at 3-3 before saving two match point opportunities in the decider to complete the 4-3 comeback (5-11, 9-11, 7-11, 11-7, 16-14, 12-10, 13-11). Manika Batra’s fine run has come to an end in Budapest after the Indian qualifier fell at the second stage of the main draw. A rising prospect and certainly moving in the right direction but on this occasion the 2018 Commonwealth Games champion was simply outclassed by one of the world’s finest players in Chen Meng (11-6, 11-5, 11-5, 11-2). Trailing 1-2 but Sun Yingsha didn’t waste anytime in making a response, hitting back with three consecutive game wins to beat another up-and-coming talent in Liu Gaoyang 4-2 (11-9, 16-18, 9-11, 11-5, 11-8, 11-9). Displaying great maturity with a nerve-free performance, no.6 seed Chen Xingtong moves through to the quarter-finals with little to worry about after posting a four-nil win against Dutch opponent Li Jie (11-3, 11-4, 11-8, 11-4). Next up for the 21-year-old Chinese star is a meeting with top seed and fellow compatriot Zhu Yuling. Lam Siu Hang and Wong Chun Ting came close to a quarter-final exit in the men’s Ddoubles draw following a closely contested affair with qualifiers Kou Lei and Wei Shihao of Ukraine and Croatia respectively. The no.3 seeds from Hong Kong looked to be in some trouble at 1-2 down but they remained level-headed, claiming back-to-back games to seal a 3-2 win (11-6, 10-12, 6-11, 12-10, 11-7). China’s Liang Jingkun and Xu Xin, seeded fifth, have knocked the top seeded partnership of Liao Cheng-Ting and Lin Yun-Ju out of the proceedings in Budapest. Needing just four games to get the job done (11-8, 8-11, 11-7, 11-6) Liang Jingkun and Xu Xin will face French qualifiers Tristan Flore and Emmanuel Lebesson for a spot in the final. Elizabeta Samara has withdrawn from the Seamaster 2019 Hungarian Open after coming down with a virus. The Romanian was due to face Liu Shiwen in the last 16 of the Women’s Singles draw as well as join Bernadette Szocs in Women’s Doubles action later in the day. Germany’s Patrick Franziska has also withdrawn due to picking up a virus. Make sure you don’t miss Hugo Calderano’s exciting Round of 16 encounter with Kristian Karlsson set to take place at 18:00 local time. Seeded first for the Women’s Doubles competition and thus big favourites to capture the title, China’s Wang Manyu and Zhu Yuling are through to the last four following a hard earned 3-1 victory over Singapore’s Lin Ye and Yu Mengyu (13-11, 13-11, 8-11, 11-8). Spectators in Budapest were left disappointed at the quarter-finals stage of the Women’s Doubles draw as the host nation’s very own Georgina Pota and Swedish partner Matilda Ekholm experienced defeat at the hands of second seeds Doo Hoi Kem and Lee Ho Ching. The no.6 seeds put up a brave fight and made the brighter start of the two pairs but a fine response from their Hong Kong counterparts proved decisive with the match eventually being decided in four games (8-11, 11-9, 11-9, 11-6). Unseeded for the competition but Alexander Shibaev and Polina Mikhailova will compete in the semi-finals after pulling off a sensational 3-0 victory over the no.3 seeds from Chinese Taipei, Lin Yun-Ju and Cheng I-Ching (11-8, 14-12, 11-5). The only previous occasion the two Russians had formed a partnership was last year at the Liebherr 2018 European Championships and now they are in the semi-finals of an ITTF World Tour event! Hungary’s Adam Szudi and Szandra Pergel are through to the semi-finals of the Mixed Doubles event, delighting the home fans with a terrific showing against the French duo of Tristan Flore and Laura Gasnier (11-5, 11-9, 6-11, 11-8). Over on table 2 the Slovak pair of Lubomir Pistej and Barbora Balazova progress following a “walkover” win against Austria’s Stefan Fegerl and Sofia Polcanova. We are back with the latest from the Seamaster 2019 ITTF World Tour and once again there’s plenty to look forward to. Here’s the schedule for Friday 18th January here. Confidence a vital ingredient, it would appear that having reached the quarter-finals last year has given Sweden’s Kristian Karlsson a major boost of self-belief; the no.14 seed, he made a very impressive start to his campaign. He overcame the defensive skills of Panagiotis Gionis of Greece in four straight games (11-7, 11-9, 11-8, 11-3). The winner in 2017, China’s Chen Xingtong made her intentions clear in her opening women’s singles encounter; her speed very much in evidence, the no.6 seed, she accounted for the Czech Republic’s Hana Matelova in five games (11-6, 11-7, 12-10, 6-11, 11-2). The host nation’s leading player, Georgina Pota, the no.15 seed, experienced defeat at the hands of India’s Manika Batra, the changes in pace made by the Commonwealth Games champion, long pimpled rubber on the backhand, smooth reversed on the forehand never allowed the Hungarian to settle into her preferred fast attacking rhythm; a contest to test the nerves, the minimal two point margin in the seventh game determined the result (10-12, 12-10, 11-9, 6-11, 11-8, 8-11, 12-10). Two close games but then there was not stopping Germany’s Petrissa Solja as she upset the order of merit; she beat Austria’s Sofia Polcanova in four straight games (11-9, 13-11, 11-1, 11-6). Mixed doubles success in partnership with Liu Shiwen, followed by an opening round men’s doubles win in harness with Liang Jiangkun, not a single game dropped; it was a different scenario when he faced a spirited German in the guise of Benedikt Duda in the men’s singles opening round. He needed the full seven games to secure victory (1-5, 11-3, 7-11, 11-5, 11-13, 13-15, 11-5). The no.13 seed, the favourite to win but Frenchman Simon Gauzy was well aware that Croatia’s Wei Shihao would prove a most testing opponent; he was correct. He emerged successful but only by the very narrowest of margins (9-11, 11-7, 7-11, 12-10, 11-5, 7-11, 11-9). Sweden’s Truls Moregard, 16 years old, achieved his goal of reaching the main draw of the men’s singles event but he went no further; he was beaten by Korea Republic’s Lim Jonghoon, the no.12 seed and winner last year at the ITTF Challenge Series Polish Open by Korea Republic’s Lim Jonghoon (11-9, 11-6, 15-13, 11-8). Need someone sitting courtside to give advice with whom you have a good understanding; England’s Liam Pitchford chose the ideal counsellor; colleague Paul Drinkhall, the player with whom he won gold at the Gold Coast 2018 Commonwealth Games. In the opening round of the men’s singles event he beat China’s Yu Ziyang in four straight games (12-10, 11-9, 11-4, 11-7). A loud cry of sheer relief and a fist pump in the air, these were the scenes as Bernadette Szocs secured her spot in the next round in dramatic circumstances. Trailing Chinese Taipei’s Cheng Hsien-Tzu 2-3 on games the no.10 seed from Romania recovered to take the match the full distance, completing the comeback by the narrowest of margins in the final game (11-9, 8-11, 9-11, 13-11, 1-11, 16-14, 15-13). Winner of the Women’s Singles title last year, defending champion Wang Manyu has put her name into last 16 following a commanding outing from the Chinese player in round one. Coming up against fellow compatriot Chen Ke, no.3 seed Wang Manyu was rarely troubled with three of the four games being decided by a margin of four points or greater (11-7, 11-7, 12-10, 11-4). Up against the odds in a case of qualifier versus title contender but that didn’t hold Liu Gaoyang back as the unseeded Chinese star claimed a major scalp in the opening round of Women’s Singles action. Opposing no.5 seed Feng Tianwei of Singapore, Liu Gaoyang took her chances when required in the early stages of the match and ultimately proved the stronger of the two athletes on this occasion (11-8, 9-11, 15-13, 11-5, 11-7). Exiting against expectations earlier in the day when she and partner Wong Chun Ting fell at the first hurdle of the Mixed Doubles draw, Doo Hoi Kem has suffered her second defeat of the day and consequently her second departure in Budapest. The Hong Kong medal hopeful, seeded seventh, put up a fight but was second best in the match with Germany’s Shan Xiaona taking the win across six games (5-11, 11-8, 11-5, 7-11, 11-8, 11-5). Required to negotiate the qualification rounds, now Benedikt Duda and Ruwen Filus have guaranteed their spot in the quarter-finals of the Men’s Doubles tournament. Facing what was on paper a stern challenge in the form of Hong Kong’s Ho Kwan Kit and Ng Pak Nam but as events unfolded the German duo came away with a convincing win, inflicting a stunning 3-0 defeat upon the no.4 seeds (11-9, 11-9, 11-8). Competing on home soil but Nandor Ecseki and Adam Szudi failed to find a path through the opening round of the men’s doubles event in Budapest. The no.7 seeds from Hungary were shown the door by the mixed association pair of Ukraine’s Kou Lei and Croatia’s Wei Shihao, who needed just three games to earn their place in the next round (11-8, 11-7, 11-9). Austria’s Robert Gardos and Daniel Habesohn have been knocked out of the Men’s Doubles running, despite establishing an early lead in their opening round fixture. Fighting back from a 0-1 deficit, French qualifiers Tristan Flore and Emmanuel Lebesson won the next three games in succession to defeat the no.8 seeds by a 3-1 score-line (6-11, 11-6, 16-14, 11-5). The Slovak Republic’s Barbora Balazova and the Czech Republic’s Hana Matelova will play their part in the last eight after picking up a 3-1 victory over Russia’s Mariia Tailakova and Olga Vorobeva in round one (11-7, 5-11, 11-9, 11-9). Next up for the no.5 seeds is a meeting with the no.3 seeded pair from China, Chen Meng and Sun Yingsha. A formidable pair on the world stage, Sweden’s Matilda Ekholm and Hungary’s Georgina Pota are through to the second round of Women’s Doubles action following a tight encounter with Irina Ciobanu and Adina Diaconu. The mixed association partnership were pushed to deuce twice in the match and didn’t slip up on either occasion, sending the Romanian duo out of the competition (13-11, 8-11, 12-10, 11-6). Romania will be represented in the quarter-finals of the Women’s Doubles draw with Elizabeta Samara and Bernadette Szocs sealing their spot in the next round thanks to an impressive outing on the opening morning in Budapest. The sixth seeds survived a difficult test at the first hurdle but eventually crossed the finish line, seeing off France’s Laura Gasnier and Carole Grundisch 3-1 (12-10, 7-11, 12-10, 11-6). China’s Wang Manyu and Zhu Yuling have negotiated the Round of 16 with little difficulty after posting a perfect 3-0 win against Spain’s Galia Dvorak and Zhang Xuan (11-6, 11-7, 11-8). A successful start in Budapest and the top seeds will now have the honour of facing the no.8 seeded combination from Singapore, Lin Ye and Yu Mengyu on Friday. Named as the no.1 seeded partnership for the Mixed Doubles competition, however, Hong Kong’s Wong Chun Ting and Doo Hoi Kem have failed to progress beyond the Round of 16. Against the odds the unseeded French pair of Tristan Flore and Laura Gasnier showed great character and ambition to beat the top seeds across four games (13-11, 9-11, 11-7, 11-7). Champions at the Seamaster 2018 Austrian Open a couple of months back, Xu Xin and Liu Shiwen are off to a solid start at the opening ITTF World Tour event of 2019 following a convincing display in the first round of the Mixed Doubles event in Budapest. Facing Italian qualifiers Niagol Stoyanov and Giorgia Piccolin, the no.5 seeded Chinese pair needed just three games (11-8, 11-6, 11-6) to set up a quarter-finals clash with Germany’s Patrick Franziska and Petrissa Solja. How far can go Chinese Mixed Doubles pair Liu Shiwen & Xu Xin at the #2019HUNopen #ITTFWorldTour? Adam Szudi and Szandra Pergel have handed the host nation the perfect start to the day in Budapest after the Hungarian pair came through their opening round encounter in style. Pushed hard in games one and three but the no.8 seeds gave a good account of themselves, eliminating Hong Kong’s Ho Kwan Kit and Lee Ho Ching by a 3-1 margin (13-11, 11-6, 1-11, 11-5). The man sitting in the coaches chair for the Hungarian line-up, Peter Aranyosi praised the home fans for their support of the players. Seeded fourth for the Mixed Doubles draw but Alvaro Robles and Galia Dvorak have fallen at the first hurdle. The Spanish duo suffered a straight games defeat at the hands of Germany’s Patrick Franziska and Petrissa Solja (11-9, 11-5, 14-12), who move through to the last eight at their expense. Following two days of qualification action the Seamaster 2019 ITTF World Tour has officially got underway in Budapest. Take a look at the schedule for Thursday 17th January here. Hungary’s Bernadett Balint and Mercedes Nagyvaradi withstood a spirited recovery by India’s Manika Batra and Archana Girish Kamath to book their place in the main draw (11-6, 11-5, 5-11, 5-11, 11-3); very much the person to thank for the win was coach, Zoltan Batorfi. Different nationalities but in recent times establishing a good understanding, the combination of Russia’s Yana Noskova and Austria’s Sofia Polcanova beat Luxembourg’s Sarah de Nutte and Danielle Konnsbruck in four games to reserve their main draw place (11-3, 7-11, 11-5, 11-6). Compatriots but never previously doubles partners at an open international tournament, Slovenia’s Deni Kozul and Bojan Tokic (Slovenia) beat Sweden’s Anton Källberg and Truls Moregard (11-9, 5-11, 11-4, 8-11, 11-8) to secure their main draw place. A new partnership for the Czech Republic’s Tomas Polansky and Pavel Sirucek matters gradually gelled. In a full distance five games duel the secured a main draw place by overcoming Brazil’s Eric Jouti and Gustavo Tsuboi (11-6, 3-11, 11-7, 7-11, 11-6). Serbia’s Aleksandar Karakasevic and Izabela Lupulesku alongside Russia’s Alexander Shibaev and Polina Mikhailova both emerged success to reserve main draw places but they came perilously close to defeat; both pairs had to recover from two games to nil deficits. Eventually, Aleksandar Karakasevic and Izabela Lupulesku overcame Luxembourg’s Luka Mladenovic (12-14, 9-11, 11-8, 11-7, 11-7); Alexander Shibaev and Polina Mikhailova beat Romania’s Ovidiu Ionescu and Bernadette Szocs (6-11, 9-11, 11-6, 11-4, 11-6). Runners up at the 2018 ITTF Challenge Belarus Open in November, the combination of Ukraine’s Kou Lei and Croatia’s Wei Shihao emerged successful in their opening round encounter beating very much a new look Swedish combination. The usual partner for Kristian Karlsson is Mattias Falck, on this occasion it was Jon Persson; the end result a five games defeat (8-11, 11-8, 11-7, 7-11, 11-8). At the Seamaster 2018 ITTF World Tour Kaisa China Open in Shenzhen, the untried combination of Romania’s Ovidiu Ionescu and Spain’s Alvaro Robles caused a major upset at the semi-final stage by beating China’s Ma Long and Xu Xin; in Budapest they came perilously close to receiving a taste of their own medicine. They eventually overcame Slovenia’s Darko Jorgic and Jan Zibrat by the very narrowest of decisions (11-6, 7-11, 9-11, 11-5, 12-10). The United Kingdom in harmony, Charlotte Carey of Wales and England’s Maria Tsaptsinos emerged the pair to attract the attention as play commenced in the qualification stage of the women’s singles event. They accounted for Poland’s Natalia Bajor and Natalia Partyka in five games (11-8, 11-7, 5-11, 8-11, 11-8). Coach, Jörgen Persson set Truls Moregard the initial goal of reaching the main draw; his 16 year old Swedish compatriot duly obliged. In the fourth preliminary round he accounted for Belgium’s Florent Lambiet in straight games (12-10, 11-7, 11-8, 13-11). “Truls won most of the key points in this match hence the result says it was an easy match but it was harder then it looked.” Jörgen Persson (Coach). At the Liebherr 2018 Men’s World Cup in Paris, Panagiotis Gionis had departed proceedings in the initial group stage, one of the reasons being that he lost to Brazil’s Gustavo Tsuboi; now two months later he extracted revenge. He succeeded by the very narrowest of margins (12-10, 13-15, 8-11, 11-9, 11-7, 4-11, 11-9) and in so doing reserved his place in the main draw. Close matches were very much the order of the day but there was none closer than the contest between China’s Zhao Zihao and Lin Yun-Ju; Zhao Zihao emerged successful in a dramatic seven games duel decided by the minimal margin (11-7, 6-11, 11-8, 6-11, 11-6, 11-13, 15-13). Gold medallist in 2010 in Singapore, it was defeat for Gu Yuting; for Chinese colleague Liu Gaoyang who succeeded in Nanjing in 2014 and Sun Yingsha, the winner last year in Buenos Aires, it was success. Crowned Commonwealth Games champion in Gold Coast, Australia last April and later in the year voted “Breakthrough Star of the Year”, India’s Manika Batra underlined the fact that her success in 2018 was no flash in the pan. She beat Romania’s Daniela Monteiro-Dodean (8-11, 11-8, 11-8, 10-12, 11-4, 9-11, 11-7) to book her place in the main draw. Rush, play every return with power and against a defensive player it can prove disastrous, keep calm, be patient and wait for the opportunity to arise and success may well follow. It was the situation for Laura Gasnier of France; she overcame the stalwart backspin skills of Ukraine’s Tetyana Bilenko (11-4, 8-11, 7-11, 11-9, 11-8, 11-3) to reserve her place in the main draw. China’s Chen Ke, one of a number of players in China’s rising generation trying to secure a place amongst her nation’s elite, duly emerged success in the third preliminary round of the women’s singles event. She beat Ukraine’s Maragaryta Pesotska in straight games (12-10, 11-9, 11-7, 11-8) but is well aware that only sheer perfection will gain her a place in the national team. A place in the main draw secured and secured in an emphatic manner; the Czech Republic’s Hanna Matelova gave one of the most impressive performances in the third preliminary round of the women’s singles event. She beat Hana Matelova bt Nadezhda Bogdanova in four straight games (11-3, 11-4, 11-4, 11-2); a fine effort and somewhat modest about her achievement. One of Germany’s up-and-coming young stars Qiu Dang has chalked up one of the biggest upsets of the qualification tournament yet, eliminating Portugal’s Tiago Apolonia in preliminary round three of the Men’s Singles event. Recovering from a game down, Qiu Dang demonstrated great maturity on his way to a resounding 4-1 victory (6-11, 11-8, 11-9, 11-7, 11-5) and will take his place in the fourth round of qualifying where the Slovak Republic’s Wang Yang awaits. Standing firm in the face of danger, Belgium’s Florent Lambiet remains in the hunt for a spot in the main draw after denying a late comeback attempt from Austrian opponent Daniel Habesohn (11-7, 11-8, 9-11, 11-3, 9-11, 6-11, 11-8). Who will make the main draw? Crowned Men’s Singles champion in 2017, however, China’s Yan An won’t be making an appearance in the main event in two years on following a crushing defeat against the man who was crowned 2016 European champion in Budapest, Emmanuel Lebesson. The Frenchman produced an excellent display in preliminary round three, ending his Chinese counterpart’s hopes in six games (11-9, 9-11, 11-8, 6-11, 11-9, 11-6) to set up a meeting with the Czech Republic’s David Reitspies in the afternoon session of play. A player known for her expert control on the ball, but the picture wasn’t looking so bright for Tetyana Bilenko in the early stages of her preliminary round two encounter, falling 1-3 behind to Spain’s Maria Xiao. However, following a tactical shakeup from Bilenko, the Ukraine representative began to claw her way back into the match before eventually getting the job done 4-3 (11-7, 8-11, 5-11, 3-11, 11-7, 11-9, 11-5). One of Hong Kong’s finest players but Lee Ho Ching’s qualification campaign has been brought to an abrupt end in Budapest after losing out across seven games in her opening fixture of the day. Leading by two games to one but Lee Ho Ching failed to capitalise on the situation with Romanian opponent Daniela Monteiro Dodean emerging victorious 4-3 (5-11, 11-8, 9-11, 13-11, 11-9, 10-12, 11-5), advancing to the next stage of the competition in the process. Nadezhda Bogdanova has extended her run in the preliminary rounds of the Women’s Singles event following an intense encounter with Germany’s Nina Mittelham. The Belarusian competitor saw her two games advantage diminish as Mittelham hit back with three game wins of her own to take a 2-3 lead. However, despite the momentum being against her Bogdanova showed great fighting spirit to eventually seal the victory by a 4-3 score-line (12-10, 12-10, 7-11, 7-11, 4-11, 11-7, 11-8). The second day of the qualification tournament is officially underway as the race for the Seamaster 2019 Hungarian Open continues in Budapest. You can view all of the day’s fixtures here. 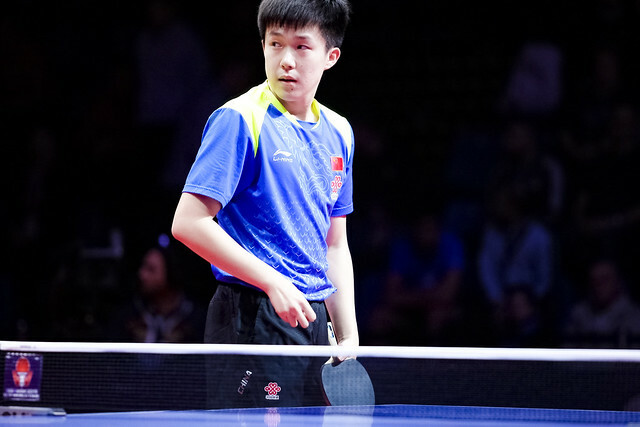 In late May at the Seamaster 2018 ITTF World Tour China Open in Shenzhen, competing on home soil, in the second preliminary round, Zhou Qihao had experienced defeat at the hands of Ukraine’s Kou Lei; in Budapest they met in the same round. On this occasion Zhou Qihao won in six games (11-5, 9-11, 9-11, 11-8, 12-10, 13-11). Earlier in the evening both Sharath Kamal Achanta and Sathiyan Gnanasekaran had experienced defeat; as the day closed Harmeet Desai restored national honour; he beat Germany’s Tobias Hippler (11-9, 11-9, 11-9, 4-11, 9-11, 12-10). Six days short of his 26th birthday, facing a player 10 years his senior and one of the very few European pen-hold grip players, Paraguay’s Marcelo Aguirre maintained his composure to stave off a spirited recovery by Spain’s Jesus Cantero (11-7, 11-3, 6-11, 9-11, 6-11, 11-7, 11-8). Gruelling hard fought matches; there was none to compare with the contest in which Brazil’s Gustavo Tsuboi eventually overcame Romania’s Cristian Pletea in seven games (11-4, 11-6, 8-11, 12-10, 10-12, 10-12, 11-8). The match lasted some 80 minutes! A clash of styles, very much the reverse, Serbia’s Zsolt Peto found the technical skills of India’s Sathiyan Gnanasekaran very much to his liking; he emerged successful six games to cause an upset of note (9-11, 11-8, 11-7, 11-8, 8-11, 11-6). On the current men’s world rankings, Sathiyan Gnanasekaran stands at no.31, Zsolt Peto at no.254. Defeat for Sathiyan Gnanasekaran, soon after there was more disappointing news for India; Sharath Kamal Achanta was beaten by Pär Gerell (7-11, 11-4, 12-10, 12-10, 4-11, 11-8). Success exactly 11 weeks ago in the second preliminary round of the men’s singles event at the Seamaster 2018 ITTF World Tour Austrian Open; in Budapest, when once again facing Chinese Taipei’s Liao Cheng-Ting, the Czech Republic’s David Reitspies repeated the feat. Peter Engel sitting courtside on coaching duty, David Reitspies emerged successful in five games (11-5, 11-8, 5-11, 12-10, 11-7). Need a coach in who can have the greatest trust; for Sweden’s Truls Moregard he had an advisor in whom he could have the ultimate faith, none other than Jörgen Persson, the 1991 world champion. He guided the 16 year old to a five games success against Slovakia’s Lubomir Pistej (11-7, 10-12, 11-7, 13-11, 11-8). Runner up at the European Championships in consecutive year in 2010 in Ostrava and the following year in Gdansk but in recent time not the best of fortunes on the international scene; Germany’s Patrick Baum was very much a player in form on the opening day in Budapest. He beat Brazil’s Jouti Eric Jouti in four straight games (11-8, 13-11, 11-9, 11-8) to keep a place in the main draw very much alive. Just one step short of a place in the Seamaster 2018 ITTF World Tour Grand Finals, Hong Kong’s Ho Kwan Kit and Lee Ho Ching came perilously close to defeat; eventually they survived by the minimal two point margin in the decider (7-11, 11-4, 8-11, 11-5, 11-9). The full five games needed to secure victory; it was the same for Romania’s Ovidiu Ionescu and Bernadette Szocs against the French pairing of Emmanuel Lebesson and Carole Grundisch (11-6, 11-7, 10-12, 3-11, 11-6), as it was for Slovenia’s Darko Jorgic and Alex Galic in opposition to the Greek combination of Konstantinos Angelakis and Alkaterini Toliou (8-11, 5-11, 11-9, 12-10, 13-11). A testing opening round but once a rhythm was found Germany’s Kristin Lang asserted her authority; she beat Poland’s Magdalena Sikorska in six games (11-5, 11-8, 4-11, 10-12, 11-5, 12-10). Listed at no.498 on the current world rankings, Aneta Maksuti caused the biggest upset of the day so far; in the opening preliminary round of the women’s singles event she beat Hong Kong’s Ng Wing Nam in a tense seven games encounter (11-4, 4-11, 11-5, 3-11, 9-11, 11-7, 11-8). In an exciting duel between two of the finest teenage stars India and Belarus has to offer it was Archana Girish Kamath who emerged successful over Daria Trigolos in Budapest. Despite holding a two games advantage, Kamath soon found herself on the brink of defeat as Trigolos responded with three game wins of her own. However, the young Indian took her performance up another level to claim a 4-3 victory (11-5, 11-5, 8-11, 8-11, 9-11, 11-9, 11-9). Szandra Pergel has negotiated the opening round of qualification with little to fret about with the Hungarian hopeful needed just five games to see off Greece’s Aikaterini Toliou (11-5, 10-12, 11-8, 11-5, 11-5). Israel’s Omri Ben Ari and Greece’s Konstantinos Konstantinopoulos played out a thrilling seven game encounter in the opening round of preliminary action in Budapest. In a topsy-turvy affair neither player was able to register back-to-back game wins over the course of the match with Omri Ben Ari moving through by the narrowest of margins (11-9, 9-11, 11-8, 8-11, 11-8, 9-11, 13-11). Trailing by a two games deficit but Spain’s Jesus Cantero shows us what he’s all about, fighting back with four game wins in a row to beat Ukraine’s Andrii Grebeniuk 4-2 (7-11, 6-11, 11-8, 11-6, 11-6, 11-3) in round one. Now 43 years of age, Aleksander Karakasevic is through to the second round of qualifying after producing a fine display against Hungary’s Patrik Juhasz (11-7, 11-9, 11-6, 11-7). The first day of qualification action is underway in Budapest and the host nation has already been given one result to celebrate with Csaba Andras coming through his Men’s Singles Preliminary Round 1 match with flying colours. Prevailing over Slovak opponent Alexander Valuch by a convincing 4-0 margin (11-8, 11-9, 13-11, 11-7), Andras has the honour of facing a difficult adversary in the next round in Germany’s Patrick Baum.